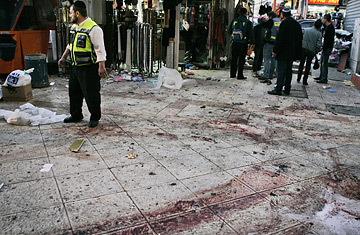 An Israeli Zaka worker stands next to bloodstains at the scene of a suicide attack in the town of Dimona in southern Israel. It's difficult to decide which will go over the edge first, Lebanon or Gaza. Maybe both at the same time, hand in hand, and  if you believe Israel  with a gentle shove from Iran. Bets are on Gaza to explode first. Although Hamas claimed that Monday's suicide bomber in Dimona, the first in a year, came from the West Bank, the Israelis still are investigating whether he got into the country from Gaza via Egypt while the border fence at Rafah was breached. It's certainly possible. An estimated 750,000 Palestinians, half of Gaza's population, crossed into Egypt and back, primarily to shop for basic goods unavailable at home. Israel also suspects that advanced long-range rockets, anti-tank rockets and anti-aircraft missiles were smuggled into Gaza during the breach. But more ominously, Israel claimed that, along with the weapons, Iranian-trained Hamas guerrillas came across at the same time  presumably to operate the new weapons. The Negev was hit by rockets on Tuesday, but they were an old model, Qassams. At this point Israel has to be wondering if Hamas is planning a real war, something along the lines of the 34-day war in 2006 between Israel and Hizballah. A Hamas official didn't put that suspicion to rest when he said that next time Hamas might knock a hole in the fence that separates Gaza from Israel. Israel knows too that Hamas would like to drag Egypt into it. And, who knows, it might work. At some level someone in Egypt is complicit in smuggling weapons into Gaza. Egypt's Muslim Brotherhood, the main opposition party, still looks at Hamas as its Palestinian branch. Iran and Hizballah have been soliciting Egypt's cooperation in more help for Gaza. Will Egyptian President Mubarak be able to hold the line, keep a lid on Gaza, when Israel itself can't? Count on it, Israel will do something to change the status quo in Gaza. One option is to build a bigger and higher wall around the country. Construction on a wall separating Israel and Egypt has already started. But little good it will do against the Hamas rockets Israel thinks are coming into Egypt. Walls aside, what Israel sorely misses is the capacity to strike fear into its neighbors, deterrence. The Winograd Commission spelled it out in bleak terms in its report on Israel's failures during the 34-day war. "Israel cannot survive," the official statement said, unless it is able to deter its enemies  teach Hamas and Hizballah a lesson they won't forget. Lebanon is second on the neighborhood triage list, but only because no one has been killed in the last 24 hours, at least at this writing. On the other hand, since the Lebanese army fired on demonstrators in the Shi'a southern suburbs on January 27  killing seven, five of whom were connected to Iran's proxy, Hizballah  there have been 11 attacks on the army. The only reason Hizballah has not responded more forcefully is that the time is not right. But a war in nearby Gaza might just be the perfect time. Robert Baer, a former CIA field officer assigned to the Middle East, is TIME.com's intelligence columnist and the author of See No Evil and, most recently, the novel Blow the House Down.